Hurricane Harvey was one of the most destructive storms in U.S. history, and its most enduring impact was on the mental health of Houston-area residents, according to a new report from Rice University’s Hurricane Harvey Registry. The first-of-its-kind registry was launched in April 2018 to document the 2017 storm’s impact, uncover disparity throughout the region and shape public solutions for years to come. The first report details Harvey’s direct impact on those who have registered so far — nearly 9,800 people, whose responses indicate they live in households representing more than 29,000. The initial report was released at a Feb. 21 press conference at City Hall with Houston Mayor Sylvester Turner, Rice University Provost Marie Lynn Miranda, Houston Health Department Chief Environmental Science Officer ​Loren Raun​, Harris County Public Health Executive Director ​Umair Shah and Environmental Defense Fund Senior Director for Climate and Health ​Elena Craft. 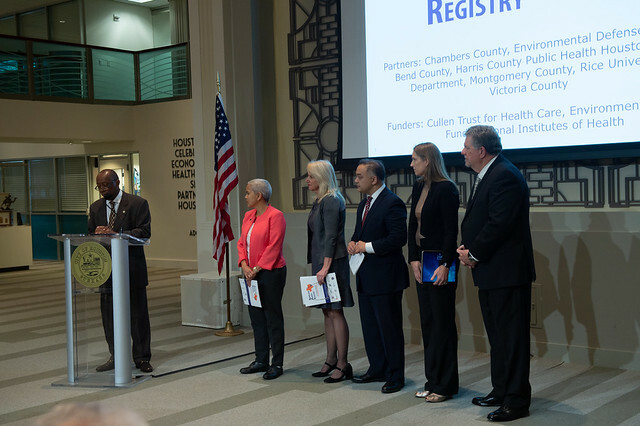 The registry is a collaborative project including Chambers County, the Environmental Defense Fund, Fort Bend County, Harris County Public Health, the Houston Health Department, Montgomery County, Victoria County and Rice’s Children’s Environmental Health Initiative (CEHI). “The purpose of the registry is to identify and track Harvey’s long-term health and housing impacts, tailor interventions based on what we learn and better prepare us for future events,” said Miranda, who oversees the CEHI. Registrees were most likely to report mental health issues stemming from the storm. Nearly two-thirds reported unintended or intrusive thoughts following the storm, a higher rate than those who reported physical symptoms. However, Harvey victims were not immune to physical ailments. Heightened exposure to mold, bacteria and other environmental toxins has been linked to new and worsening respiratory conditions including cough, difficult or labored breathing, sinus symptoms, asthma and pneumonia, the survey found. The report also found that 46 percent of the respondents were forced from their homes, and their average displacement lasted 20 weeks. Turner described the preliminary findings as “fascinating” but noted that “this important work is not yet done.” Miranda added that the survey is continuing to engage with residents from communities throughout the region. Learn more about the registry and share your Harvey experience at https://harveyregistry.rice.edu/.